6.30 pm It has been a marvellous start to the community dig. 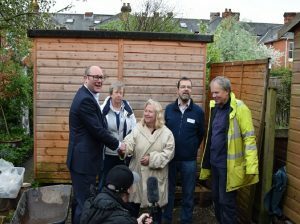 The rain didn’t dampen the enthusiasm or prevent good progress being made in all the trenches. Trench 8, the continuation to last year’s Trench 7 (where parts of a Norman arch were found), has been the subject of much anticipation, and the first day’s discoveries have proven as exciting as we could have hoped. 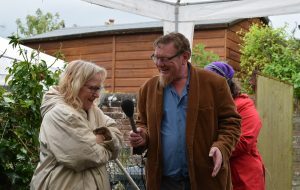 Mark Mardell from Radio 4 jokes with householder Justine Field. 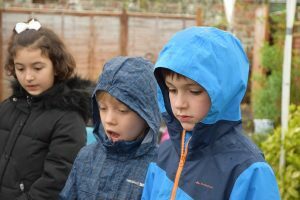 Luckily the weather cleared up in time for him to visit all the gardens and catch some sound effects of digging and sieving, as well as chatting to some of the diggers and supervisors. The programme goes out at 1pm on Sunday, and we’ll be looking forward to hearing it. 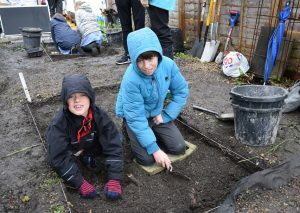 3.50 pm This afternoon twelve children from the local primary school came to take part in the dig. 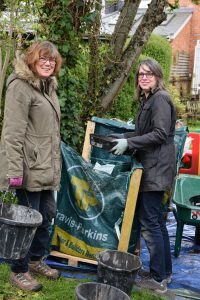 Undaunted by the weather, they took turns sieving, digging and cleaning. 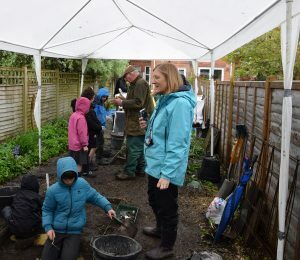 Fantastic to give them a taste of a real archaeological dig in their own neighbourhood. Keep an eye on the blog. We should have a video of their visit by tomorrow morning. 3.30pm Good progress is being made but the weather threatens to intervene. 1 pm. 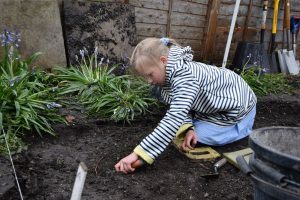 A number of pottery finds have already emerged from the top, mainly Victorian, layers of soil. 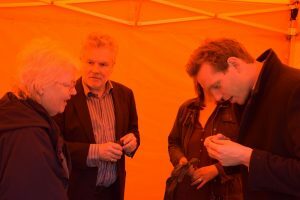 Experts Julian Dineen and Iain Rushbrook from Bellman’s Auction House in Hyde Street dropped by to have a look and explain to Hyde900’s Janet what they are. Digging is coming along well. There are already significant signs of what may prove to be a medieval wall in Trench 8 in the garden of No.14. 11.40am Digging is coming along well. 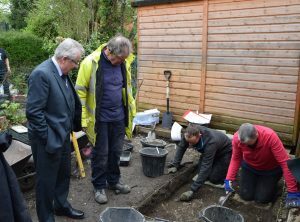 Here, you can see John Crook, chief archeologist of Winchester Cathedral, showing Mayor David McLean signs of archaeology that have already come to light through the sterling digging efforts of Ben Goddard and Caroline Beasley (pictured). 11am Digging is underway. 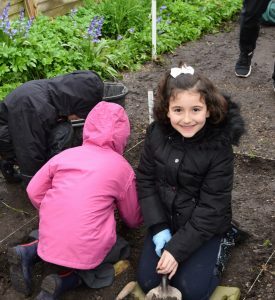 The top layers of each trench are being carefully excavated, with all the soil that comes out them being sieved for small finds. All six new trenches are being dug by our first teams of participants. 9.30am The dig has begun! John Leeson from Belgarum Estates, who have sponsored this year’s dig, officially opens the dig. Here you can see him congratulating householder Justine Field as he announces that the dig is open and wishes us all a productive and enjoyable weekend.